Use a VPN to connect when traveling and don't miss your favorite shows. Question of the week: I don’t want to miss my team play basketball in the March Madness tournament, but I have to go on a business trip to Europe next week. How can I watch U.S. TV when I am traveling overseas? Many expats and travelers use a VPN service to access streaming services while living or traveling in foreign countries. 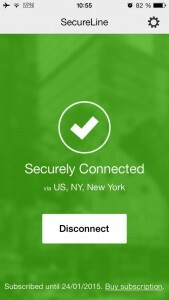 The VPN (Virtual Private Network) allows you to securely connect to a server of your choice, so that it acts as a “proxy” from a different location than where you are. Avast SecureLine VPN is one of those services. If you are traveling in Europe, then select a server in the U.S. to access geo-restricted sites. When you log on to CBS, Netflix, Hulu, etc, the service will identify the server as coming from the correct location, and allow you to log on. Another benefit of VPN when traveling is the security you get when using free Wi-Fi at hotels and airports. The VPN creates a private ‘tunnel’ through the internet for your data to travel through, and everything – your web browsing history, your email, your IMs, your VOIP, everything – inbound and outbound through the tunnel is encrypted. Even if your data is intercepted, your identity is protected, since the VPN masks your IP address. Read more about the security aspect in our previous blog, Avast SecureLine protects your Android or iPhone from cybercriminal surveillance. Avast SecureLine VPN is completely integrated into all of Avast’s free and premium products and is available for Android and iOS devices and PCs. Avast SecureLine VPN is available for Android on Google Play and for iOS in the Apple App Store. You can also download our VPN for PC right here.